London Days: Happy Birthday Less is More! I have been wanting to join in the Less is More 4th Birthday challenge all week. I wanted to celebrate their Birthday and I also love the combo of pink and grey. Last night I finally got to craft. I tried something new to me-embossing an image on vellum and then using copics to colour it. I stamped the image and sentiment in grey ink directly onto the card and then added my embossed and coloured image onto this. A few baby pink enamel dots added 'just because'. I am so pleased I got to play along! I will also enter this into Seize the Birthday-no heart twist for me! Super CAS card - love that your "dimensional" image is both pink and grey! WOWZERS Sandie you are rockin! This is eye-poppingly and jaw-droppingly gorgeous. Perfectly CAS and super duper adorable. So thrilled you found a bit of time to sneak in with a card for the birthday challenge. Gorgeous card, Sandie. Your butterfly is beautiful. Fabulous CAS card Sandie - LOVE the butterfly! I deleted my previous comment because I realised it was the same as the previous one. What I said was that I loved your card especially the butterfly! This is lovely Sandie, this butterfly looks beautiful! Very beautiful, CAS and stylish! The vellum butterfly looks fab. beautiful, very fine card. I love the color combination is so romantic! Very pretty. Love the layered butterfly. Thanks so much for joining us at Seize the Birthday. Wow-wee, this is such a stunning design!! Gorgeous!!!!!!! Really gorgeous, Sandie...love how you've treated the butterfly. 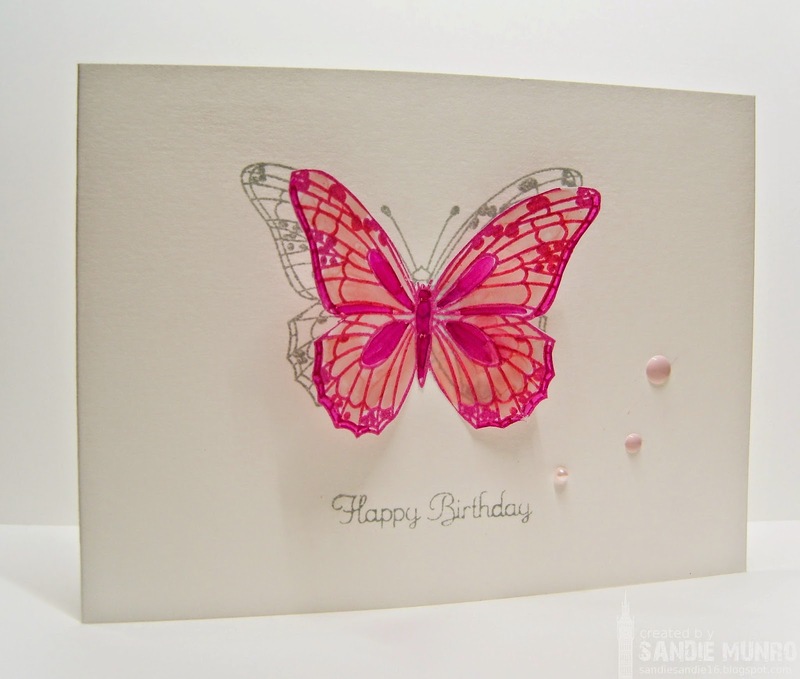 Your embossed butterfly on vellum looks really beautiful, Sandie - gorgeous card! Love the way you stamped the butterfly and then laid the vellum on top. The coloured vellum looks beautiful! The grey stamped butterfly on the card base gives a great shade effect to your popped up vellum butterfly. This is a really nice effect I'll need to remember! What a gorgeous, delicate butterfly! Love it! This is Stunning! Love the dubble stamped and cut-out butterfly... clever idea!